Professional wrestling isn’t a sport; Vince McMahon, overlord of WWE and therefore the most powerful person in the industry, calls it “sports entertainment”, and the kindest and most accurate way to describe it is as a performance art in which masquerading as a sport is part of the performance. Part of the magic of “kayfabe” – the illusion of spontaneity and competition surrounding pro wrestling – is that when you are little your wrestling heroes are just as cool and superhuman to you as Father Christmas is, whilst when you see through the illusion it becomes possible to appreciate the form on a whole new level. Kayfabe jargon refers to “smarks” or “smart marks” – fans who know that the whole deal is fake, but enjoy and pay for wrestling products and shows because they appreciate the combination of athleticism and sleight-of-hand necessary to pull off complex stunts in the ring, or because they like to follow along wrestling storylines even though they know it’s a story. Smarks and the Internet are a match made in heaven. The very subjects that smarks are interested in or get worked up about – which old acts still have it and who needs to retire from the ring before they embarrass themselves or destroy their health entirely, which new acts are the most exciting, what scripting (or “booking”) decisions have captured people’s imaginations and which have fallen flat, and so on – are precisely the sort of fodder which drives internet conversations and flamewars in any fandom. Booking and other backstage matters are a matter of particular interest to clued-in wrestling fans, and it’s natural that that should be the case: after all, the bookers plan out the matches based on behind-the-scenes business decisions made concerning which wrestlers need to be promoted as the major faces of a promotion and which wrestlers are out there mostly to make the major players look good. It’s also natural that smarks should believe that they can do a better job than the professional writers. Part of this is just the sort of smug armchair quarterbacking endemic to fandom; part of this comes down to even major promotions making a range of incredibly foolish, self-defeating, and damaging booking decisions over the years. 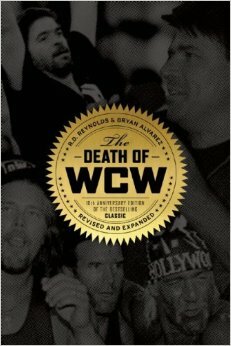 Bryan Alvarez’s Figure 4 website is a well-established online “dirtsheet” (a zine produced to give the inside behind-the-kayfabe news about pro wrestling), and RD Reynolds’ WrestleCrap was one of the first to dedicate itself to covering the worst in wrestling. In The Death of WCW, Reynolds and Alvarez form a journalistic tag team to take a well-researched and bitingly sarcastic look at the destruction of the only wrestling promotion to remotely approach the size of WWF/WWE during the 1990s.